Most people think that removing knots and tangled braids has to be done at a salon or that it always is going to be painful. This simply isn't true. 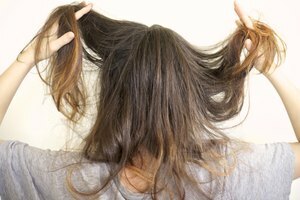 There are easy home remedies that can get rid of knots and tangles before you resort to yelping in pain or shelling out cash to a professional (or worse, grabbing a pair of scissors). Put a little glob of conditioner on the knot or tangled braid. 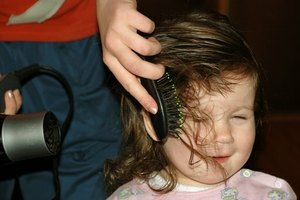 Any kind will do, but one that is especially formulated for tangles is best. Work the conditioner into the knot by rubbing it with your fingers, being careful not to pull on the hair and tighten the knot. 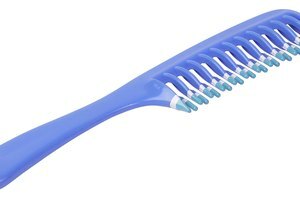 Then use a wide tooth comb or pick and, starting from the very bottom of the knot, comb the strands out of the knot. Don't move up in the knot until you've cleared out the tangles at the bottom of it. Be patient; it will take some time to get through a knot this way, but the conditioner will lubricate the strands of the hair and make removing the knot easier than if nothing were coating the knot. Repeat this process with a comb that has finer teeth to make sure the knot or tangle is completely gone. Sometimes snarls are caused by something getting in the hair, like residue from sticky candy or gum. If you need to get out this kind of knot, first try taking a few ice cubes and getting the substance in the knot cold enough to freeze. Crumble the substance with your fingers after it's frozen and then use conditioner to dissolve the rest and use a wide tooth comb to get the knot out. Mayonnaise, peanut butter, and vinegar also can work to dissolve certain substances that get in the hair or can cut the grimy oil that may be keeping the hair snarled. Simply rub these on the snarl, leave in for a few minutes, comb out the snarl (leave the mayo or other substance you're using in while you work so it can keep lubricating), and then rinse. Whenever you have a lot of snarls in your hair, use a hair claw clip to lift the top portions of your hair up and out of the way. Clear out all the knots in the bottom portion of your hair first, and then gradually bring down hair out of the clip until all of the hair has been combed. A useful tool for removing knots from hair is a curved embroidery needle. When combing doesn't work, you may be able to very carefully insert the needle into the knot and use it to gently work the knot lose. The curve is nice because it lets you pull up strands with minimal effort. Doing this takes incredible patience, but it's better than having to cut a chunk out of your hair. How do I Remove Flarp From Hair?